In 2016 the highest expatriate packages for mid to senior managers within the Asia Pacific region were paid in Japan with an average package worth USD 329,000. Mainland China is catching up fast and has reached the second highest expatriate package in the region. The value of a typical total compensation package (including cash compensation and benefits) for foreign executives in China increased to USD 290,000. This is up from the fourth position in 2015 with the cost of an average expatriate package having surged by 5% within one year. Tier 1 Cities in Mainland China: the high compensation level in Mainland China is mainly caused by an increasing demand for expatriate managers, combined with rising costs of living and air pollution, which makes it more challenging to attract and retain international executive talent. This trend is particularly observable in China's tier 1 cities such as Beijing, Shanghai, or Guangzhou. These cities represent the most developed areas of the country and are considered to be the center of economic activity. Industries that have emerged as driving forces of Chinese economy tend to cluster around Tier 1 locations, as those cities have the biggest potential to attract foreign and domestic investments. Tier 2 Cities in Mainland China: when taking tier 2 cities into consideration, the compensation packages for expatriate executives is significantly lower and reaches an average of USD 231,000. If only these cities were taken into account, China would appear near the bottom of the regional ranking. Tier 2 cities, represented by locations such as Dalian, Tianjin, Qingdao, Chengdu, Nanjing, Shenzhen, and Suzhou, are catching up fast - they have a well established infrastructure and offer fast access to international airports. As China's wages rise nationwide and interior regions receive greater investment and governmental support, foreign-invested companies are venturing more into China's second-tier locations. Hong Kong: meanwhile the expatriate population in Hong Kong has recently declined and an increasing amount of expatriate executives, especially from the United States, England, and Australia are leaving the island. The gap between the total expatriate packages offered in Mainland China and Hong Kong has widened. The total cost of an expatriate pay package in Hong Kong has dropped by 2% and reached USD 267,000 on average. Taiwan: the lowest expatriate packages within the Greater China region are paid in Taiwan, with an average total expatriate pay package of about USD 234,000 per year. One of the reasons for the smaller expatriate packages in Taiwan is that expenses for accommodation and international schooling are lower compared to other regions. The cost to companies of providing the benefits element of the package is almost half as high in Taiwan as in Hong Kong, for example. Expatriate managers in China are especially in demand for job functions such as sales and marketing, followed by banking and financial services, education, human resources, advertising, manufacturing, healthcare, and the IT sector. 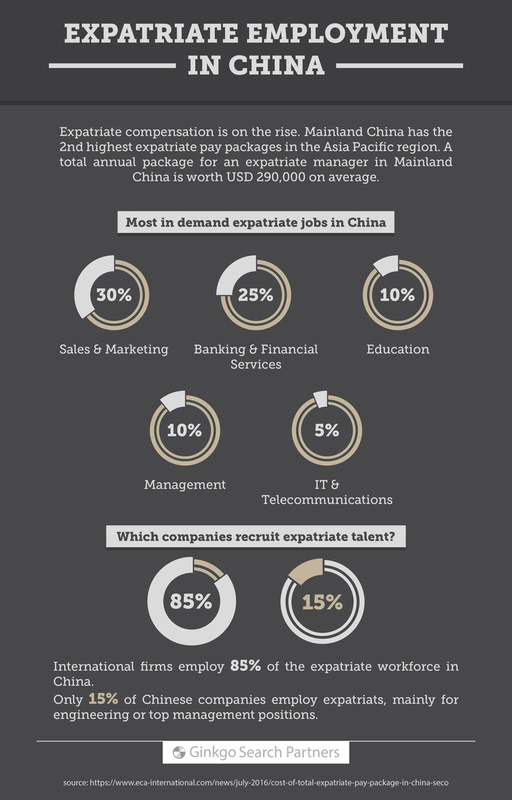 As the infographic above indicates, 85% of expatriates are employed by international corporations in China. Only 15% of Chinese companies currently employ foreign executive talent. There has been a trend in recent years for Chinese companies to hire foreign executives since they are facing a shortage of highly skilled managers. Another reason for higher demand for foreign talent is being spurred by governmental policies that encourage companies to hire executives directly from the international market. Since China is moving up the value chain from a low-cost manufacturing location to a diversified innovation-driven economy and increasingly expanding business activities overseas, the demand for executive and skilled technical foreign talent is expected to continue.